Holt Renfrew will reportedly grow the size of its Calgary store by expanding upwards. Part of an unused 25,500 square foot fourth level will become accessible via a new staircase from the store's third level men's store. Holt Renfrew will also expand the store's menswear, women's footwear and accessories areas. Holt Renfrew's shuttered 4th floor will become accessible to shoppers as part of the Calgary store's expansion. Click this image for the entire PDF via 20 Vic Management. 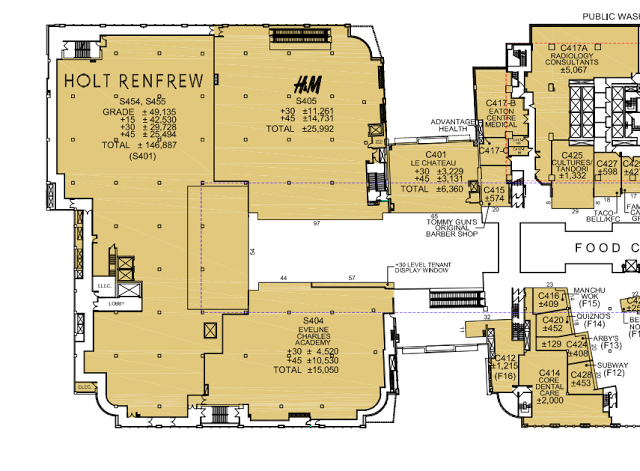 According to lease plans provided by landlord 20 Vic Management, Holt Renfrew occupies a total of almost 147,000 square feet in Calgary. Adding a fourth level will expand the store's retail area by about 20% to about 120,000 square feet. Opening in early 2015, the store's fourth floor will become home to a licensed 2,500 square foot restaurant/cafe with a capacity of 60 patrons, overlooking the CORE shopping centre's massive skylight. Holt Renfrew currently operates restaurants at its Toronto (Bloor Street), Yorkdale Shopping Centre, Montreal and Edmonton locations. A restaurant/cafe will also eventually open in Holt's expanded Vancouver store. The store's women's footwear salon will be expanded substantially, including the addition of several designer shops-in-stores. Photo: Holt Renfrew. Holt Renfrew president Mark Derbyshire confirms that Holt's will expand its Calgary women's footwear department by about 20%, adding several designer boutiques. Holt's Yorkdale Shopping Centre store, considered a prototype for future Holt Renfrew renovations, features footwear shops-in-store for luxury brands Jimmy Choo, Christian Louboutin, Manolo Blahnik, Gucci and Salvatore Ferragamo. Few details are known on the store's expanded accessories area, though it already carries a substantial number of luxury brand concessions. Louis Vuitton, Prada, Gucci, Hermes and Tiffany & Co. are among the store's shop-in-stores, and more could be added with the expansion. Its Yorkdale store, for example, recently added new shops for Christian Dior, Miu Miu and De Beers. The Calgary store's menswear department, currently located on the store's third floor, will also be expanded by about 40%. We'll report more when we learn what's planned, as it appears that Holt Renfrew is looking to gain market share from upscale menswear retailer Harry Rosen, which operates a massive 30,650 square foot store in the same shopping complex. A 1,000 square foot luxury shopping 'Apartment' will be featured as part of Holt Renfrew's Calgary store expansion. Photo: Janson Goldstein. Holt Renfrew will add a 1,000 square foot luxury shopping 'Apartment', in addition to expanding its current 2,800 square foot personal shopping suites. When completed, both areas will occupy about 4,100 square feet. These will differentiate Calgary's Holt Renfrew from the city's Nordstrom store, which will lack dedicated shopping suites in its new Chinook Centre location. The 'Apartment' concept will be added to Holt's Vancouver and Bloor Street stores, joining an existing location at its prototype Yorkdale store. Opening in early 2015, The Apartment will offer full wardrobe care and personal styling services, spa services, as well as an area to dine. Holt Renfrew will reportedly hire an additional 50 staff as part of the expansion, adding to the store's 270 staff. Interestingly, Calgary's 140,000 square foot Nordstrom store, opening next week, will house about 530 employees. Calgary's current Holt Renfrew location opened in the fall of 2009, replacing a 43,000 square foot unit across the street. Holt Renfrew has operated Calgary locations since the 1950's, save for a period in the late 1980's when it shuttered a former Penny Lane location to eventually open its location at the Calgary Eaton Centre. At one time, Holt Renfrew also had a relatively small location at Calgary's Chinook Centre, when the retailer operated substantially more smaller stores in various markets across Canada.